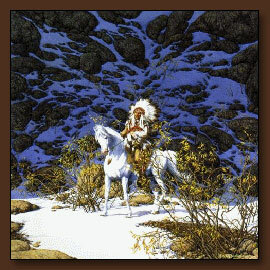 Purchase Bev Doolittle Art Prints online from ArtBarbarians.com located in Minnesota. There's something about movement in art, it doesn't always happen! But one artist that we have gives the feeling of the subject being alive, not a static statue. Bev Doolittle art gives that kind of feel as you look at the extensive line of her art here online. Like most people you probably can identify bygone days and the romance of a time removed from us when life may have been hard, but just maybe a bit slower. And this artist brings out those feelings of a vibrant past that we treasure so much and we feature here on our web site. We have a couple of examples of this fine artist's work. You get a sense of perspective and movement in her art and an excellent color representation that is deep and rich, along with a sense of light and shadow. Bev Doolittle art prints have been famous for a couple of decades and have a timeless quality to them. Bev Doolittle was born and raised in California. In 1968, she graduated from the Art Center College of Design in Los Angeles. She met her husband, Jay, at school and they started married life with a painting trip to Bryce Canyon and Zion National Parks" a portent of things to come. For the next five years, however, the Doolittles were art directors in an ad agency in Los Angeles. "It paid well," Bev explains, "but we didn't like living in the city. We wanted to be close to nature, to paint outdoors and we wanted to travel." They have now accomplished both. Their frequent travels and backpacking trips have covered the western United States, Canada, Baja California and East Africa. They now live close to nature in the high desert of California. Bev Doolittle's subject matter is provided by the out-of-doors. "I love nature," she says. "I try to look beyond the obvious and create unique, meaningful paintings depicting our Western wilderness and its inhabitants. I start with a concept and attempt to convey it through strong design coupled with detailed realism. I want people to think when they look at my paintings." Both of these pictures featured here showcase works that have a kinetic feel to them. 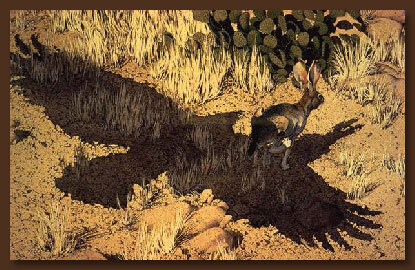 You can almost sense the sway of the horse above or the rabbit being chased by a winged predator. It's almost as if the chase is going to go on right off the canvas. It's that kind of artistic rendering that makes her art so special and prized by collectors of fine art. Call us if you have any questions about anything you see on our web site or need to know more about Bev Doolittle art prints. We're happy to answer your questions personally regarding availability or something special you're looking for.